St. Tammany Parish Hospital Rehabilitation Services offers a full range of inpatient and outpatient services to help patients return to an independent and active lifestyle. We provide treatment through the continuum of care from admission to the hospital, through the inpatient rehabilitation unit to the outpatient rehabilitation program. 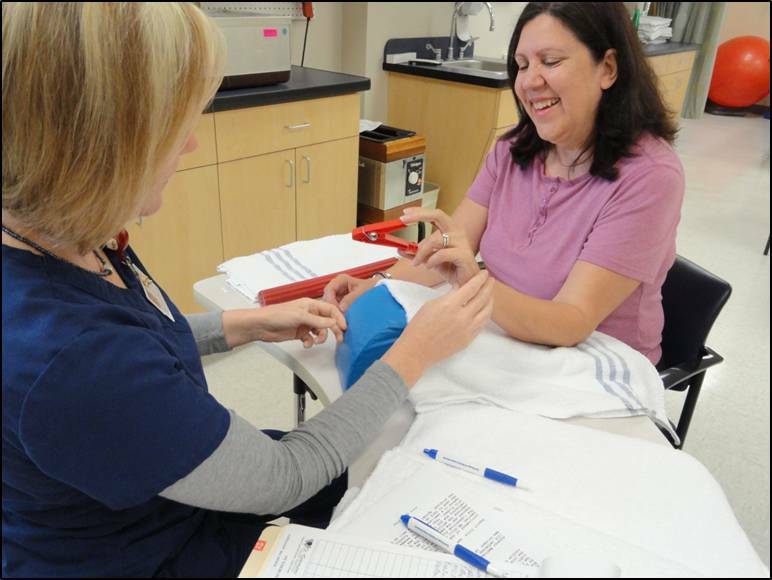 Our multidisciplinary team, including nurses and occupational, physical and speech therapists, assists individuals to believe in themselves, take risks and take a step toward independence. Our programs and services can treat a multitude of disabilities including cerebral vascular accident (stroke), traumatic and non-traumatic brain injury, traumatic and non-traumatic spinal cord injury, hip fracture, any degenerative neurological deficit, below-the-knee and above-the-knee amputation, joint replacement, hand therapy, work-related injury, lymphedema, disease caused by poly-arthritis and any major multiple fractures. St. Tammany Parish Hospital's inpatient rehab unit is a 14-bed acute rehab unit located on the second floor of the hospital. The unit's staffing consists of registered nurses, licensed practical nurses and certified nursing assistants ready to provide 24-hour rehab nursing care seven days a week. Of the registered nurses who provide care, three are certified rehabilitation nurses and one is a medical/surgical certified nurse. Patients treated on the Rehab Unit have disabilities related to stroke, spinal cord injury, hip fracture, hip replacement, bilateral knee replacements, multiple fractures, major multiple trauma, brain injury and deconditioning because of surgery or other medical problems. The Rehab Unit's Medical Director, Dr. Gollamudi Reddy, coordinates the care of all patients on the rehab unit with support from the various hospital specialties who are involved in the patient's medical plan of care. Individualized treatment plans to maximize independent function in all aspects of daily living are our main focus at St. Tammany Parish Hospital Therapy and Wellness. Our team of board certified and state licensed therapists are highly qualified and available to provide a wide variety of services to our community. Physical, occupational and speech therapy services are available on-site to treat both pediatric and adult patients with various diagnoses. Located at 1 N. Azalea Dr., Covington, the hospital's outpatient therapy unit is equipped with both private treatment rooms and a common area for functional exercise.